Today marks the start of our blogging “Pay It Forward” Campaign. Good deeds is what Pay It Forward is all about. You do a good deed for someone, just because. You ask for nothing in return, you just do something nice for someone today and make their day special. It’s the little things in life that matter the most. I am working with my good friend Bacon over at Pig Love to get our Pay It Forward campaign off and running. We are firm believers that by doing good deeds for someone is what this world needs more of. You know the saying “treat others the way you would like to be treated”. Let’s put that into action! If you are joining in with us on our Pay It Forward Campaign, just copy the graphic above and add it to your blogs sidebar and redirect it back to this post! We want to get as many bloggers as possible to join in with us & Pay It Forward! On the first Wednesday of every month, Nikitaland and Pig Love will be hosting a Pay It Forward Campaign. You have an entire month to Pay It Forward by doing good deeds for someone. Then, in a month, on February 4, 2015, we will meet back here to discuss what we have done to touch someones life. 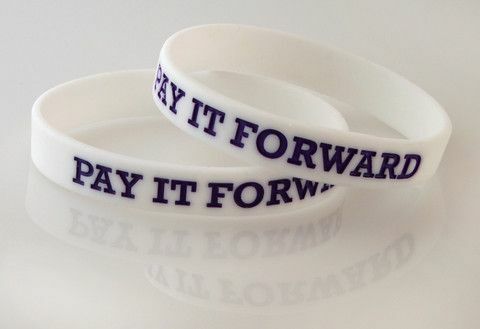 I also looked up the Pay It Forward Foundation information, and found that they are selling Pay It Forward Bracelets on their site for 50 cents each. If you would like to purchase a bracelet so that it can be a reminder for you every day to do a good deed, then click here to purchase one! Paying It Forward is really simple. You do something for someone out of the blue, not asking for anything in return just because you can. It’s the little things in life that matter the most! Paying It Forward, doing good deeds can also be contagious, because you do something nice for someone, then it makes them happy, and in return, they do a good deed for someone else, and so on! Let’s make 2015 a great year and change the world – it’s your wake up call, will you answer the call? The list is endless on what you can do, just do something & make someones day special! What will you do today to make someones day special? Pay It Forward…the power of change can make a huge difference in the world today! This entry was posted in Pay It Forward and tagged Good Deeds, Pay it Forward, Pay It Forward Campaign by Nikitaland. Bookmark the permalink. Ordered some bracelets! Thanks so much for the great blog post! Hi Marty, Mom & the Gang! We are trying to change the world a little by making good things happen! Glad to hear you ordered some bracelets too! I hope you join in with us and make someones day! Grab the graphic from our post and add it to your sidebar and link it back to us! Thanks for subscribing too, we love new friends! Great idea! We will be working on this project everyday, all year long. Thanks my friends. That is awesome! Glad to see so many bloggers are joining in on this with us! Don’t forget to grab the graphic in the post and add it to your sidebar and link it back to this post! Don’t forget to subscribe to our blog too while you are here so you can keep up with our progress & fun! Gorgeous idea!! Just what the world needs is much more of this! Hi Ya Carrie & Pups! Yes indeed, our world needs more of this for sure! I hope you will be joining us on our Pay It Forward Campaign! If so, grab the graphic in my post, add it to your sidebar, and link it back to my post. You can even reblog this post if you want to encourage others that follow your blog to join in! Spread the word! Hi Easy! Glad to hear that you are joining in with us to do good deeds! Don’t forget to snag the graphic and link it back to my post and add it to your sidebar! Invite others to join in too! A good deed does not go unnoticed, it makes a difference! Together we can change the world, one good deed at a time! Thanks for all of your help Bacon! Today is garbage day here, and I will be doing my good deed & bring up our neighbors garbage cans! That is awesome Bacon! Ya know what? Don’t you feel better inside too when you do something good for someone? It is a win-win situation. Doing good makes you HAPPY! Think about it Bacon, when your heart is happy, EVERYTHING is much better! It is about 11 degrees here today with a wind chill that is probably below zero, and I am watching for the garbage man to arrive so I can bring up the neighbors garbage cans so they don’t blow down the road. Even good deeds can be done with a snowsuit on!